Genesis Comix Zone (USA) in 08:38.67 by Archanfel. Comix Zone is a 1995 beat 'em up video game developed and published by Sega for the Sega Genesis. An unusual feature of the game is that it is set within the panels of a comic book with dialogue rendered within talk bubbles and sprites and backgrounds possessing the bright colours and dynamic drawing style favoured by superhero comics. Sketch Turner, a "starving artist" and freelance rock musician living in New York City, is working on his newest comic book, named the "Comix Zone". One night, while Sketch is working on Comix Zone during a thunderstorm, a lightning bolt strikes a panel of his comic. In this instant, the main villain of Comix Zone - a powerful mutant named Mortus - manages to escape the comic book's pages, desiring to kill Sketch so he can become flesh and blood and take over the real world. Because he does not possess any power in reality, Mortus sends Sketch into the world of his own comic, freely drawing in enemies attempting to kill him. 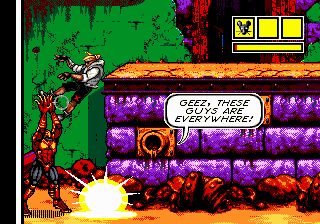 Comix Zone is an action platformer in which players control Sketch as he progresses through panels of his comic book, hoping to reach the end and escape before his own creations finish him off. Each level consists of two pages and secrets are discovered by shredding the paper and revealing items. Along with standard attacks such as punching, kicking and jump attacks, Sketch can store up to three items in his inventory to help him overcome obstacles. Archanfel improved the predecessor movie by 54.21 seconds thanks to faster strategies and manipulations.